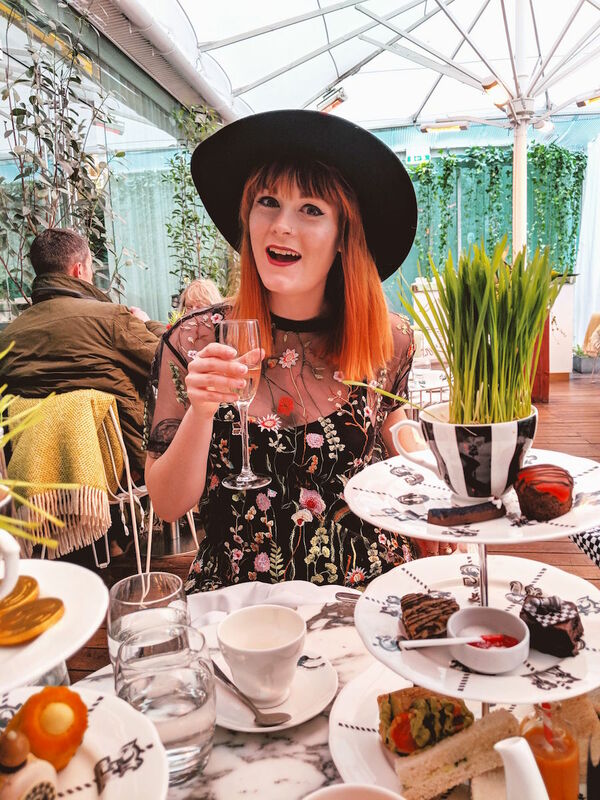 An accurate representation of how happy I was when I found out that the Sanderson now offers a vegan Mad Hatter's afternoon tea. The Sanderson hotel has quickly become one of my favourite hangouts in London over the past year. Nestled just behind Oxford Street, the hotel provides a sanctuary from the chaos of London's busiest street. 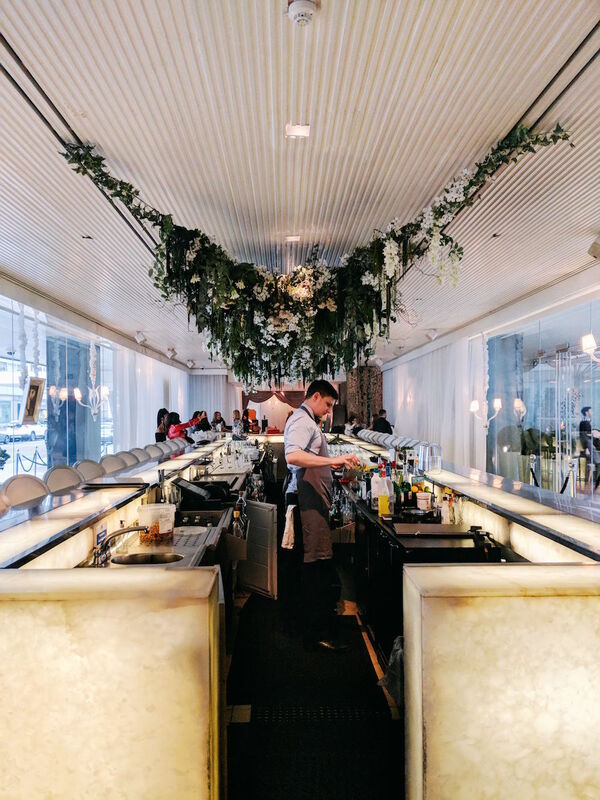 The flower-adorned Long Bar not only offers an extensive and creative cocktail menu but it also makes the ideal and picturesque lunch spot in the city's west end. 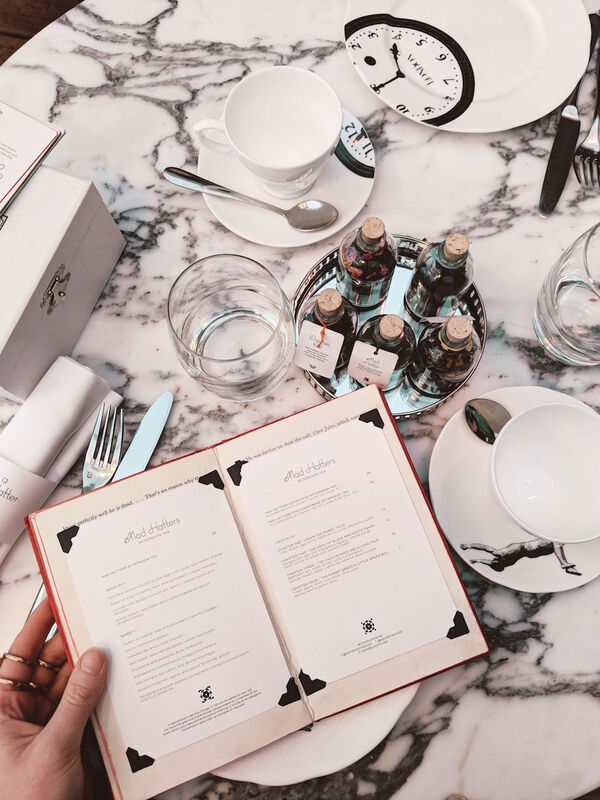 The hotel is well-known amongst Londoners for its famous Mad Hatter's Afternoon Tea, inspired by the magical world of Lewis Caroll's "Alice In Wonderland", which should be on top of every London foodie's bucket list. 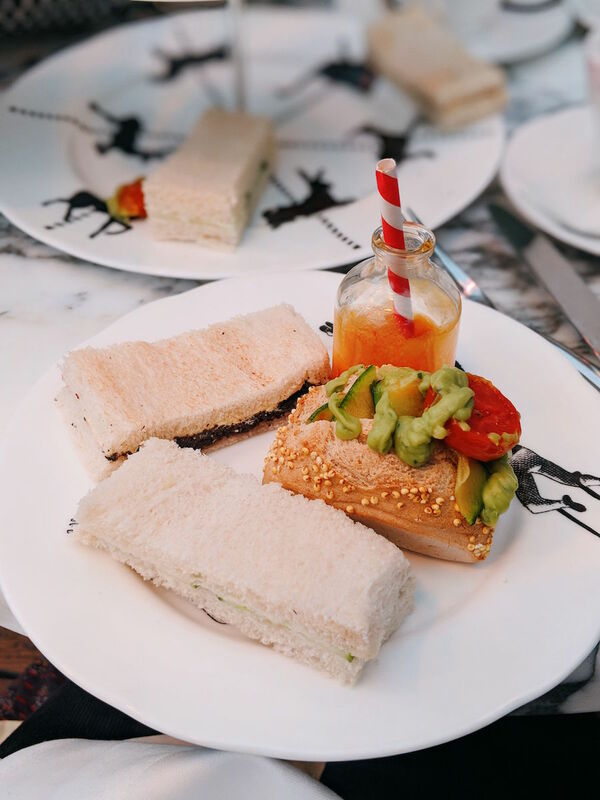 In the past there hasn't been a vegan offering on the Sanderson's menu but they recently added an entirely vegan menu meaning us plant-based fellows don't have to miss out on one of London's 'must dos'. The Mad Hatter's afternoon tea is definitely for the more playful and young at heart as the Sanderson allows you to tumble down the rabbit hole with an imaginative set-up as the menu arrives hidden inside a vintage book alongside a selection of potion style bottles with samples of the different teas available to accompany your food. After browsing through and smelling aromatic teas available, we settled on a pot of the "Mad Hatter", which is a fruity green tea infused with passion fruit, guava and mango. 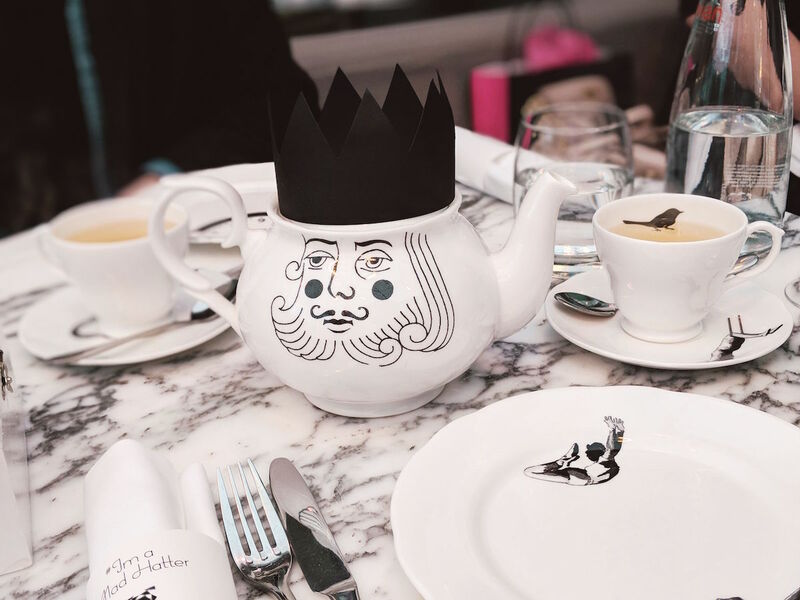 The tea arrives in an illustrated teapot with a king's face and a black paper crown, which compliments the matching illustrated Wonderland-esque plates and the working musical ballerina box full of sugar cubes. 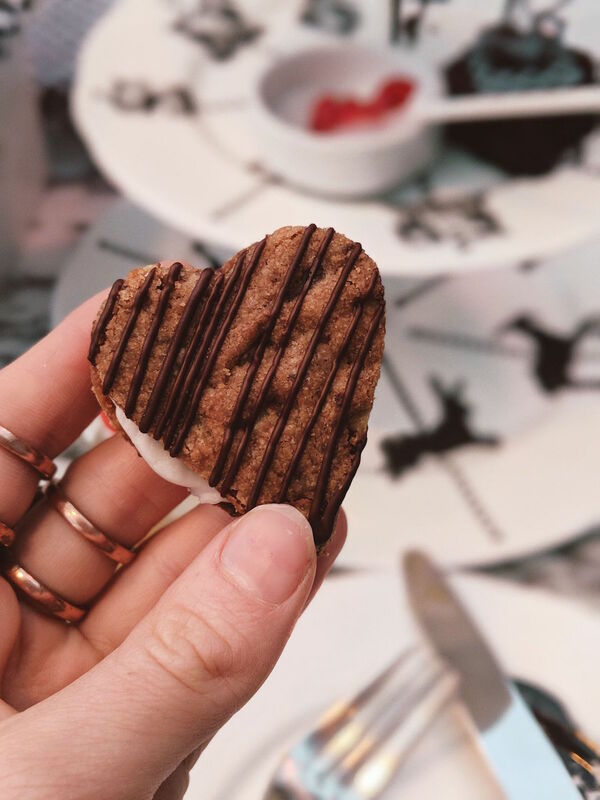 If you're looking for an afternoon tea with plenty of Instagram opportunities then this is definitely it! The vegan Mad Hatter's afternoon tea for one. As James had the vegetarian afternoon tea option, I had a stand full of vegan options all to myself (pictured above), which I was oh so very happy about! The vegan stand's savoury options includes mushrooms duxelle & avocado sandwich, confit courgette & cherry tomatoes in a bridge roll and "white rabbit" cucumber sandwiches. 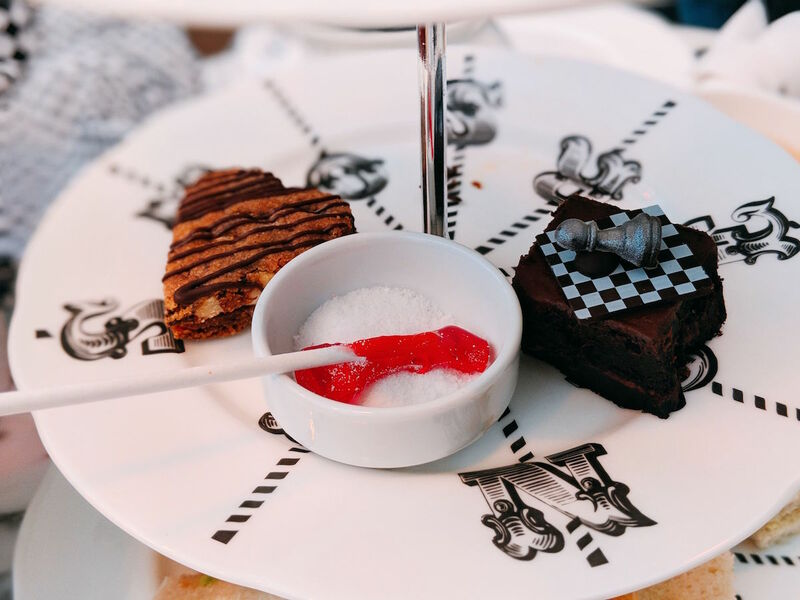 As for the sweet side, the afternoon tea includes a "Queen of Hearts" pecan, chocolate and coconut cookie, a dark chocolate chessboard gateau, "Tweedle Dee" peanut butter and orange cupcake, "Mad March" dip dab lollipop and sherbet, a chocolate and pistachio caterpillar, a Mad Hatter's lost orange carrot meringue, a warm scone with strawberry jam and a mango & mandarin "Drink Me" potion. A selection of the vegan savoury treats available in the Mad Hatter's afternoon tea. As with most afternoon teas, we worked our way up the stand from the bottom to the top eating our way through the savoury options first. Both the mushroom and cucumber sandwiches were served on a soft, fluffy white bread but the bridge roll with the confit courgette & cherry tomatoes was my favourite! 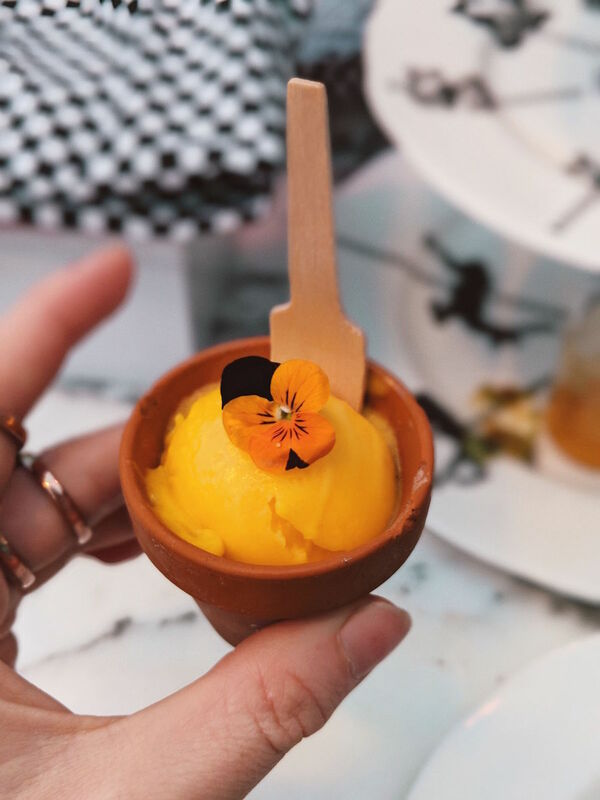 Halfway through our afternoon feast we were also treated to a scoop fruity sorbet that arrived in a clay flowerpot topped with a bright orange pansy. I found myself stopping to take photos at every single bite because every detail was just so quirky and quaint! 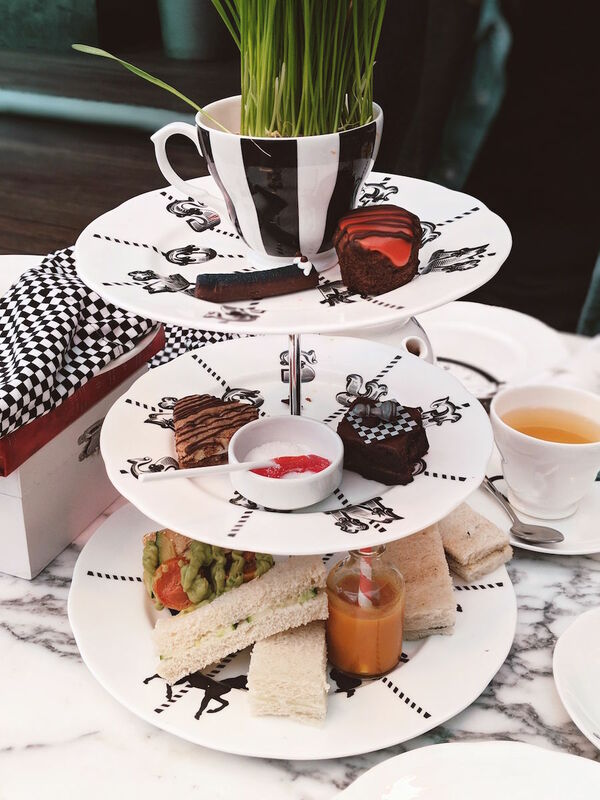 Prices for the vegan Mad Hatter's afternoon tea ranges between £48 - 65 per person depending on whether you want to add a glass of champagne to your afternoon tea - I mean, of course you do - and they also offer the original afternoon tea, a vegetarian option, a gluten-free option AND a dairy-free option too! Amazing, right?! 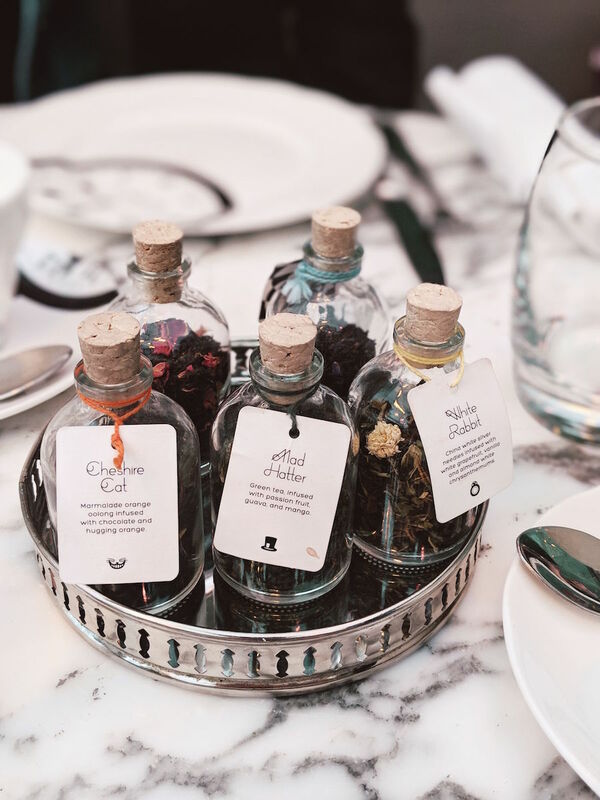 No matter what your dietary requirements, the Sanderson are likely to be able to be able to cater to your needs so that you're not left out of the Wonderland culinary experience. An extra helping of sorbet topped with a pansy. Oh I will have to look into this! I already know what to ask for my birthday I think. Love, love LOVE the look of this place! What a wonderful place to eat! Ahh this place looks amazing! I love all the little details and touches. So freaking cute! It was lovely knowing about you. Also, I wish I find an LA venue just like this for my birthday celebration. This place is gorgeous and I am sure the food was delicious too. It is going to be my 17th birthday and I want to celebrate it outside the house.